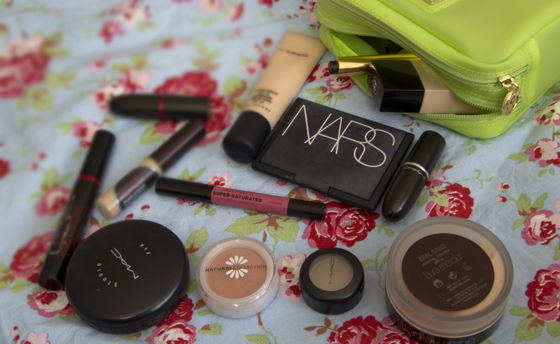 Yes, I am taking make-up on holiday with me. I do want to look good, as I will be visiting family. I know most of the people, so I want to look presentable. I'm not carrying any skincare products with me, as I have plenty at home(in Poland), which are new. 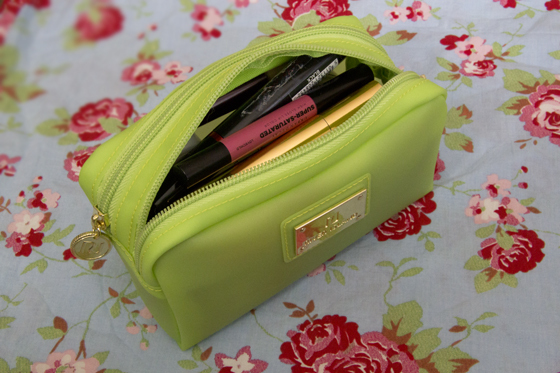 The River Island Make-up bag has the right size, fit's everything I need. For 12 days holiday. This may look like I'm taking a lot, but honestly I'm not. 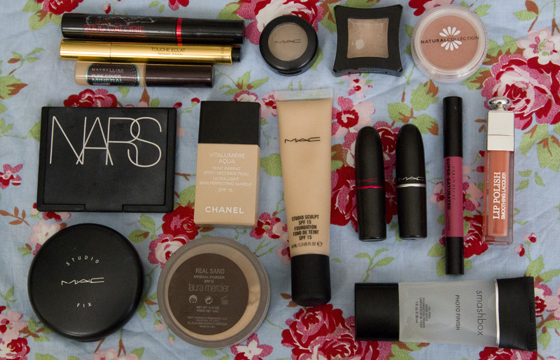 You may be wondering why I need 3 foundations, that pretty simple. I have around 2-3 uses out of the MAC Studio Sculpt foundation, so I will use it up, when I would like better coverage foundation. I'm also almost out of the Chanel Vitalumiere Aqua foundation and I love it during summer. It's very light weight and water based. The Laura Mercier is great lightweight and in the rush foundation. You never know how much time I may have to get ready, normally they give me 3 minutes until we will go somewhere, I don't wear make-up when I'm at home. Studio Fix is so good to make my skin matte. I decided to take a primer, as I have no idea if I will need some help at applying foundation more smoothly. I'm taking 2 concealers, as I love the YSL, very light. I'm just taking the Maybelline just in case I will need more coverage. This is my new Mascara and I'm amazed by it. Makes my lashes look amazing. MAC Omega is my eyebrow shadow, will be also good to use in the crease. The Illamasqua eyeshadow is great for brighting my eyes. I'm taking my bronzer just in case I need to darken up my foundation. I'm taking one blush, as I'm not big fan of blushers. Two lipsticks will be enough for me, Gaga 1 is such a pretty pink and Hue is great to wear on daily basic. Urban Decay Lip Stick is a glossy "lipstick" very smooth on the lips. One lipgloss will be enough for me, I love this one as it's very smooth. Love love love! You have such great taste! I really want to try some Nars Product, have heard so many good things about them, I was so surprised that you could fit all that in that bag! AMAZING!